This chapter summarizes the role of sustainable performance measurement system (PMS) in global supply chain, thus illustrating the theoretical and practical concepts of sustainable PMS and strategic supply chain management (SCM); and the significance of sustainable PMS in global supply chain. Therefore, it is essential for organizations to evaluate their sustainable PMS applications, establish a strategic plan to consistently explore their improvements, and rapidly respond to the sustainable PMS needs of customers in global supply chain. 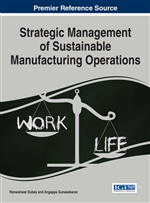 For practitioners and researchers, this chapter provides managerial guidelines for sustainable PMS applications utilized in global supply chain. Applying the sustainable PMS will significantly enhance organizational performance and reach strategic goals in global supply chain. Manufacturing industries are greatly affected by emerging technologies resulting in an influential increase in competition in local, regional, and global markets (Kasemsap, 2014). Integrity of supply chain activities is an influential factor to survive competitions in the global marketplace (Aliei, Sazvar, & Ashrafi, 2012). All organizations face the challenge of how to assess performance beyond current financial metrics (Meadows & Pike, 2010). Strategic alignment in the supply chain, assessed by the degree of matching between supply management and market requirements, is critical for the success of organizations in the global marketplace (Vachon, Halley, & Beaulieu, 2009). The competitive landscape has pushed organizations to compete not only on their own capabilities but with their entire supply chain (Hult, Ketchen, & Arrfelt, 2007). Increased customer requirements coupled with competitive pressure from globalization have forced managers to ensure that their organization’s resources are well aligned not only across all functional areas but also throughout the entire supply chain (Vachon et al., 2009).